I have a confession to make about not judging a book by it’s cover. In this case, it’s not judging an APV by photos on the web. I have seen the Vamo around for awhile, but was always a little skeptical of it. For some reason, it just looke a little cheap to me and the $60 price tag for a variable wattage electronic cigarette mod didn’t help. After finally getting one, I can honestly say that I unfairly judged the Vamo before trying it out. The skepticism is due in part to the design of the tube on the Vamo. It has a nice chrome, or in my case gun metal, finish, but the grooves around the circumference make it look cheap somehow. From a distance it looks similar to an inexpensive aluminum flashlight. These grooves may have been incorporated to highlight the modular nature of the device, which we’ll get to in a moment. Picking up the Vamo for the first time dispels any concerns about solid construction. It is solid, heavy and well constructed. At 4.75 oz. with no batteries installed, it is over 1.5 oz. heavier than the ZMAX, which is probably its closest competitor. The Vamo is also 10mm longer and 1mm wider than the ZMAX. It’s a pretty hefty device. The flat top and bottom accentuate the size of the device, but also give it a secure base to stand on. There are three components included with the Vamo, the main switch body, and extension tube and a vented end cap. The device can be used with a single 18350 battery, and with the addition of the extension tube can house either a single 18650 or two 18350s. The components screw together easily and securely. The only complaint about the construction is in regards to the bottom spring. It is too thin and results in a fair amount of battery rattle, especially when using a single flat-top 18650. 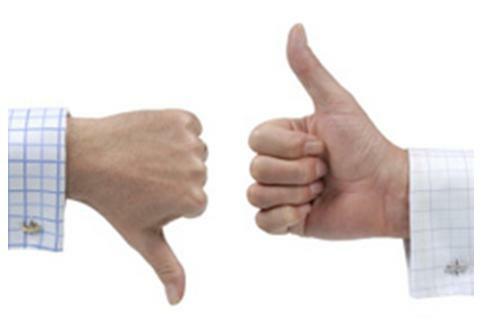 The weakness is bad enough that a good shake will actually cause the battery to lose connection, evidenced by the fact that the unit then has to be turned on again. There is a firmer spring fix, but that one apparently has too high of a resistance, resulting in heat issues (see PBusardos’ commentary on that). The three buttons on the Vamo are the main functional difference that set it apart from most of its rivals. There are a number of variations of the VAMO on the market with different button materials. The unit tested here has metal ones that match the finish on the device, making for one of the best looking button configurations available. 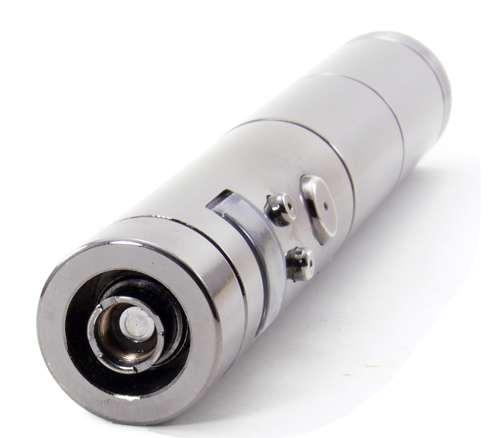 One large button serves as the activation button which is pressed to power the atomizer. Pressing this button 5 times in rapid succession turn the device on and off. This feature makes it quick and easy to disable the device for carrying in a pocket or purse. Two smaller buttons above the power button also serve multiple purposes. The left button lowers the voltage or power while the right button raises them. Pressing and holding the left button displays the remaining battery power and pressing and holding the right button displays the resistance of the atomizer or cartomizer in ohms. Pressing and holding both small buttons switches the device between variable voltage to variable power modes. A small “V” or “W” in the upper right corner indicates the present mode. Unfortunately, the voltage cannot be locked, so inadvertently pressing the voltage buttons while the unit is on is quite possible. It would have been nice to see a lock feature similar to that of the Lavatube. Like a number of other imported APVs, the Vamo we tested has some annoying characteristics when it comes to saving information. Switching between variable voltage and variable wattage modes sets either one back to minimum, either 3 volts or 3 watts. Replacing the battery also resets the output voltage to 3 volts, but oddly, wattage settings are retained when in power mode. The information mentioned above is nicely presented on a back-lit LED display. Everything is clearly legible and well lit. The clear plastic window of the display is curved to match the body of the device, but protrudes slightly, making us wonder how well it will hold up in the long term. Low battery and resistance warnings are also clearly displayed, with a “v” or ohm symbol indicating what the problem is. 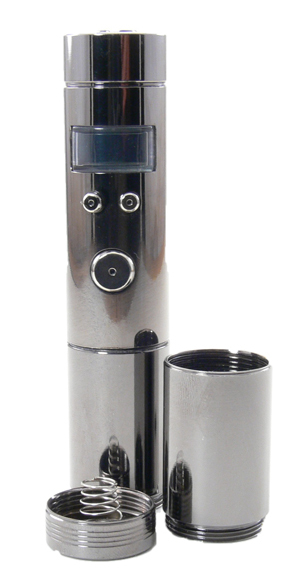 The top of the Vamo is 510 threaded with a deep well surrounding it. The outside of the connector incorporates eGo threading, making the device compatible with all 510 electronic cigarette atomizers and cartomizers as well as most of those designed for the eGo. The well is not quite wide enough to accept the wider Kangertech clearomizers. In our tests a Kangertech EVOD did fit into the well, but so tightly that airflow was stopped. over a couple of weeks worth of use, the VAMO has performed flawlessly. Voltage is impressive and it has been able to handle a variety of different resistances of cartomizers with ease. Voltage and power output seem to be very accurate and stay consistent for the life of the battery until voltage drops below 3.5 volts or so in single battery mode. Both 18650 and dual 18350 battery configurations make for an easy day and a half of vaping. Only the weak spring mars the experience, and we’ll hope for a fix to that soon. The VAMO joins a number of great variable voltage devices already on the market, as well as on my desk. Can it compete? The simple on/off sequence make it a great device to carry in a pocket, although the size and weight make it just a little cumbersome. The ease of checking the voltage also makes it an easy device to grab when leaving the house, although other can do this with just a few more presses of a single button. Where the VAMO shines is when the price is considered. At less than $60, the VAMO is one of the least expensive full performance variable power electronic cigarette devices around. Full performance, good looks and a reasonable price make the VAMO and excellent first APV or just a daily utilitarian device. The VAMO is available from a number of vendors, such as Clouds of Vapor and Madvapes (under the name Vision).